Best moving service, delivery at the best price! At ManVan we are committed to being not only your average man with a van mover but also reliable partner to help with all your moving problems. Teamwork is a key both internally and externally through working with our customers and partners in a real partnership. We have the know-how and experience to meet all your moving needs. It’s easy to do business with us since we have flexible and adaptable moving services to keep you “moving”. Whatever your situation, we offer a comprehensive menu of moving services that allow us to customize the whole move according to your needs, time and budget. Our professional moving team ensures regular contact with you, helping us to understand your needs, build a valuable relationship and tailor our service solutions to meet your needs. ManVan offers a wide range of removal services and can handle everything you need, from one man with a van to few vans or a truck. Depending on the specific details of your move, your project can be customized completely with many options. No matter if you are moving house in South Dublin, North Dublin or in any other part of Dublin we can take care of your house removals. While it may seem hard to plan and prepare a move, you are not alone. We are available to help with all aspects of house removals. Our staff carries out the whole process in a very efficient manner with a lot of care. The packaging stage is one of the longest and hardest aspects of any move. Plastic boxes are an important element in conquering your packaging. This is the easiest and safest way to transport your property from A to B. Call ManVan- the moving company with an unrivaled reputation for reliability, timeliness and careful attention to detail for a stress- free single item delivery at a competitive price. We can deliver everything from a small coach that could be handled by one man with a van to the heavy piano that needs a few strong professionals and a moving truck. Moving to another apartment is a stressful event, but we can make your anxiety a smooth move with our knowledge and experience. 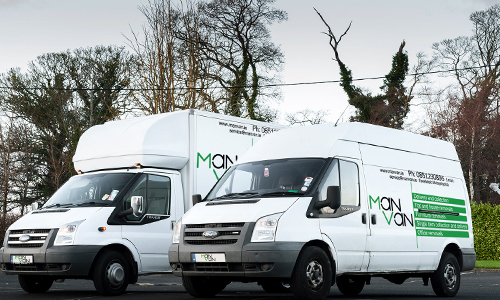 We are not just man and van, we know our job very well with more than 9 years of experience we know most of the apartments in Dublin, so we can offer the best way to move your apartment fast and safe. Avail affordable moving price and student’s moving discounts! We strive to give students an affordable professional move at all times and we are committed to providing students in Dublin with an efficient and cheap move. Our man with a van service is not only affordable but also fast and flexible, so if you are a busy student we can arrange your moving at any given time. We have many years of experience in the Dublin furniture removals. We are specialized in offering tailor-made moving services to our clients, as every move is different and requires a different approach. At ManVan we not only move your furniture but do it safe and fast and for an affordable price. Selling an antique table online, sending a desk to your college student or even buying chairs from a local artist market can quickly make delivering equipment a costly problem. It doesn’t have to be at ManVan. If you bought some big furniture like coach or bed and don’t have proper transport to bring your items home, no problem man and van can help you to deliver your new furniture hassle free from the shop straight to your house or apartment. Our driver will help you schedule a date for the delivery of furniture at your chosen time. No job is too small or too big. Whatever you are a small company that only relocates a few things or a large company that needs to move the entire office, you can trust the Man van storage removal service we provide for more than nine years. During those years we have moved in and out of all storages in Dublin, so we know our work very well, and can help you with planning your storage removal. Our guarantee to each customer is to focus on excellent customer service from the first phone call to the completion of your piano move regardless of the difficulty. Our expertly trained piano moving teams will take care of your piano with each moving using special equipment (special piano moving trolleys, ramps, blankets) to make job safe and fast. We are moving pianos more than 9 years, and have done some difficult piano moves in our time, like moving a piano up to 4th floor with no lift or delivering 500 kg upright piano to the basement. Moving office premises is easy with ManVan. When we move your office, we understand that a lot needs to be considered and planned. We have more than 9 years of office moving experience and we have all the needed tools to make your office move safe and sound, starting from moving a table or even big heavy printers. We try our best to be not only your man with a van but also your reliable moving partner and help to make your office move as easy as it can be. If you need just man and van or all moving team we are ready to help. We cover All Dublin : Dublin 1, Dublin 2, Dublin 3, Dublin 4, Dublin 5, Dublin 6, Dublin 6W, Dublin 7, Dublin 8, Dublin 9, Dublin 10, Dublin 11, Dublin 12, Dublin 13, Dublin 14, Dublin 15, Dublin 16, Dublin 18, Dublin 20, Dublin 22, Dublin 24. We operate in all Ireland: Cork, Limerick, Waterford, Kilkenny, Derry, Belfast, and Galway.